John Burgan hat für uns ein paar Bilder des Mazdas herausgekramt – und kann sogar erzählen welche Rolle das Auto beim Wahlsieg von Arnold “The Governator” Schwarzenegger gespielt hat. Roxy Music’s 1972 Remake / Remodel is punctuated at regular intervals by the obscure chant “CPL593H” – apparently a reference to the registration number of Bryan Ferry’s old Mini Clubman. So why not a panegyric to “2HGB128”, our battered old blue Mazda? Baujahr: 1988; purchased early October 2003 from Herr Lutz Seiler for the sum of $800; 225,000 miles on the clock. Sold on to Herr Norbert Kron at the end of December, mileage unknown. First Mazda memory: October 7th, cruising through Venice and Santa Monica to take in the heady political atmosphere on the streets the night Arnold Schwarzenegger was elected Governor – sorry, Governator of California. Although Arnie had already sold his stake by then, we purposely drove by Schatzi on Main and yes, there they were, the Arnie fans bearing placards. A honk – a cheer – and for a brief moment, it felt that 2HGB128 had played a very tiny part in the great democratic process. Few fragments remain of the journeys taken during those three months at Villa Aurora. Over a decade later, the video I recorded remains unedited – time for an archival revival, perhaps? – and all I can find on my hard drives are three random photographs of 2HGB128 taken at various locations across California in Autumn 2003. The first image is in the Mojave Desert, close to Joshua Tree. In the passenger seat, my wife Hassina appears to be holding up a tennis ball, thereby quite possibly increasing the value of the car. The streaked texture of the bonnet bears the blemishes and scars of fifteen years on the road. The radio worked, but was there a cassette player? Air-conditioning – nada! The next image is at the Cholada in Malibu, barely six minutes drive from Paseo Miramar along Highway One. There she is, tucked away on the right. These days this hasty snap would no doubt illustrate a Tripadvisor review, however I remember that on that particular day I had tagged along with Claudia, Zaia and the Villa Aurora team who had planned a working lunch, but found a pesky Fellow in tow – and tolerated him with their usual good grace. Alas, the Mazda did not always receive such friendly reactions. Unlike the good humoured response of the Arnie fans on Main Street back in October, the valet parker at the Beverly Hilton in November had clearly never seen such an abomination – and did not try to hide his expression when he took the keys, all but holding his nose. Sheesh, buddy, the car can be a bit ripe on a hot day, but it ain’t that bad… well, clearly the 1988 Mazda was hardly the automobile of choice of his regular Beverly Hills clientele. An evening at the Hilton’s hourly parking rate could have almost financed a full service – but hey, this is L.A. Let’s be honest, if you ever saw a 1988 Mazda parked on the streets of Pacific Palisades, you would automatically assume it belonged to one of the brigade of leaf-blowing Mexicans (mandatory start 6 in the morning) – not a resident. The third and final photo is a subjective “point of view” taken through the windscreen of 2HGB128 on an unidentified L.A. freeway by night, the red streetlights glimmering on the bonnet. Unlike the other images, I have no memory of this moment. Downtown, perhaps? We’ll never know. It’s not even a memory, just a discarded fragment on a hard drive, 229Kb of colours, traces of lights, travelling through a dystopian nightscape. A memory, if nothing else, of movement. It’s been surprisingly valuable to have a reason to revisit these inconsequential moments some twelve years later – thank you, Zaia. My memory-journey in that battered blue Mazda between October and December 2003 has taken me through Los Angeles, all the way up Highway One to San Francisco, all the way down to San Diego – meeting cousins I had never met before, but that’s another story – and the trek has now expanded to include my original move from London to Berlin back in 1992. The city became home for the next fourteen years: the completion of my film Memory of Berlin in 1998, marriage to Hassina at Standesamt Charlottenburg in 2000, Villa Aurora in 2003, moving to Denmark in 2006, back to the UK in 2008; and now coming full circle, returning once again to live in Berlin in summer 2015. Postscript: unfortunately I can’t locate it right now, but I did actually receive something from the Governator in the end, months after I had left the Villa: a cheque for $6.00 personally signed by Arnold Schwarzenegger — a rebate for the excessive car tax I had paid on 2HGB128 during those three months. And I didn’t even vote for him. That’s democracy. The video, the result of the artist’s collaboration with the author Patrick Findeis [also a fellow of Villa Aurora, ML], shows what seems like an endless flow of cars on a motorway at night. Accompanying the slow, rhythmic movement of headlights, reminiscent of the ocean’s waves nearby, is a dark soundtrack whose monologic narration of short sentences does not add up to a coherent story; rather, it relays an inconsistent and almost schizophrenic stream of consciousness. The sentences, which were in fact quotes from infamous serial killers assembled by Findeis, ranged from supposed innocence and delight (‘See you in Disneyland’ and ‘I have a good time’) to dystopian visions (‘People in this time and age are brain-washed, programmed like a computer, being nothing more then puppets’, and ‘I want to see the whole city burned down’). By making the criminals’ recollections and reasons the subtext for the imagery of the familiar carscape of LA, Bastos created an elegant and challenging recontextualization that inverted the reality of serial killers as figures of exception. Like the later films of David Lynch, whose cinematic aesthetics seem an obvious inspiration for Bastos, the video insinuated that violence is embodied in everyday life: it is in the car driving next to you on the freeway on your way to and from work; and it is without a recognizable face. As one of the serial killers’ proclamations has it: ‘I am just a normal person.’ Replacing stereotypical serial killer imagery with the killers’ own words, the video came off as a radically disturbing statement, suggesting that perhaps the serial killers are not psychological freaks but extreme embodiments of a more fundamental violence haunting the nation. If you´re going through hell keep going 2011 from Rui Calçada Bastos on Vimeo. Der Berliner Schriftsteller Florian Werner war 2007 für einige Monate in Los Angeles. Die Crystal Cathedral – die erste Drive-Thru-Kathedrale der Welt – ist ihm in ganz besonderer Erinnerung geblieben. Tief im Südosten von Los Angeles, wo sich der Freeway Nummer 5 in Richtung mexikanischer Grenze fräst: Das künstliche Matterhorn von Disneyland erhebt sich links des Freeways, kann aber dem Gebäude gegenüber nicht annähernd das Gletscherwasser reichen. Komplett mit verspiegeltem Glas verkleidet, erhebt sich die Crystal Cathedral majestätisch funkelnd über der Skyline von Orange County. Erbaut wurde sie 1980 von Pastor Robert Schuller, der früh erkannte, dass Angelenos zwar gern zur Kirche gehen, aber nur ungern ihr Auto verlassen, und daher hier die erste Drive-In-Kathedrale der Welt eröffnete. 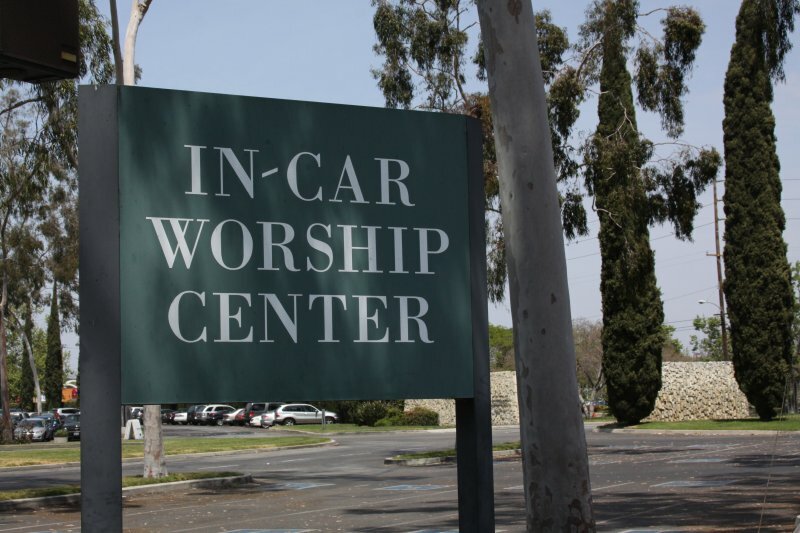 Wer will, parkt einfach auf einem der mit „In-Car Worship Center“ markierten Plätze und kann von dort aus bequem der so genannten „Hour of Power“ über Lautsprecher lauschen. „Come as you are in your family car“, lautet der Slogan, den Schuller dazu erdichtete, und er musste nicht lange bitten: Bereits eine seiner allerersten Hours of Power (abgehalten unter einem Glockenturm namens „Tower of Power“ – der Pastor weiß einen guten Reim zu schätzen) verursachte einen Verkehrsstau auf dem I-5. Doch auch wer sein Fahrzeug verlässt und die letzten fünfzig Meter in die Kathedrale zu Fuß zurücklegt, muss während des Gottesdienstes nicht ganz auf sein Auto verzichten: Zu Beginn singt ein fünfzigköpfiger Chor, elektronisch verstärkt und von Orchester und Rockband begleitet, eine Muzak-Version von „Freude schöner Götterfunken“. Auf einem Jumbotron-Videomonitor erscheint wie beim Karaoke der dazugehörigen Text. Hinter der Kanzel springen fünf riesige Wasserfontänen in die Höhe – und dann fahren die gigantischen Kathedralenwände beiseite und geben den Blick auf den Parkplatz frei. Sei es, dass die Verstärkeranlage mächtiger wummert als bei einem Black Sabbath-Konzert, sei es, dass die Sonne, die plötzlich ungefiltert ins Kathedraleninnere fällt, so blendet: Der Effekt ist überwältigend. Und als mir meine circa hundert Jahre alte Sitznachbarin auf Geheiß des Pastors hin eröffnet, dass Gott mich liebt und sie mich auch, behaupte ich ohne zu zögern dasselbe: God loves you, and so do I.
Erweckt, gestärkt, beseelt von so viel Licht, Luft und Liebe nehme ich gerne hin, dass der Pastor in seiner darauffolgenden Predigt dazu neigt, sich in rätselhaften Gleichnissen zu ergehen. Das erste: Wir Menschen sind wie Schwimmer, die nach Hawaii kraulen. Manche von uns machen nach ein paar Metern schlapp, andere erst nach hundert Yards. Seine, also des Pastors Frau kommt sogar viele, viele Meilen weit, weil sie eine hervorragende Schwimmerin ist, doch auch sie schafft es nicht bis nach Hawaii. Aber egal: Wann immer wir nicht mehr können, kommt Jesus und bringt uns mit seinem Rettungsboot nach Honolulu. Das zweite Gleichnis: Wir Menschen sind wie Hunde, die zum ersten Mal in die Praxis unseres Herrchens kommen (Herrchen ist Arzt, muss man wissen). Wir haben keine Ahnung, was sich hinter der Tür zum Untersuchungszimmer verbirgt. Doch wir wissen, dass Herrchen dort auf uns wartet, denn wir können ihn riechen. Wir wedeln mit dem Schwanz und freuen uns darauf, ihn zu sehen. Das Herrchen ist natürlich Gott. Die Praxis ist das Leben nach dem Tod. Im Frühjahr 2001 hielt sich der Filmemacher Matl Findel in der Villa Aurora auf. An seinem 40. Geburtstag machte er sich selbst ein Geschenk. Bei meinem Aufenthalt 2001 sind mir die Obdachlosen aufgefallen, die einen eigenständigen und respektablen Eindruck auf mich gemacht haben. Ich wollte sie gern fotografieren, als Freimeilen-Helden. Der Vorgang sollte aber nichts mit Geld zu tun haben. Zum Glück ist mir eingefallen, dass ja mein 40. Geburtstag ansteht und ich sie an diesem Tag um ein Geschenk bitten könnte, nämlich ein Foto von ihnen, das ich gleich aufnehme. Am 14. März zog ich in aller Frühe los. Und weil es von Anfang an so gut geklappt hat und nie einer gezweifelt oder sich meinen Ausweis hat zeigen lassen, habe ich überhaupt jeden angesprochen, dem ich an diesem Tag begegnet bin.